This is a perfect example of what Mark Mazower called "ignorant westerners". He kept calling them "Macedo-Bulgars" yet they ALL said "WE ARE MACEDONIANS"!!!! 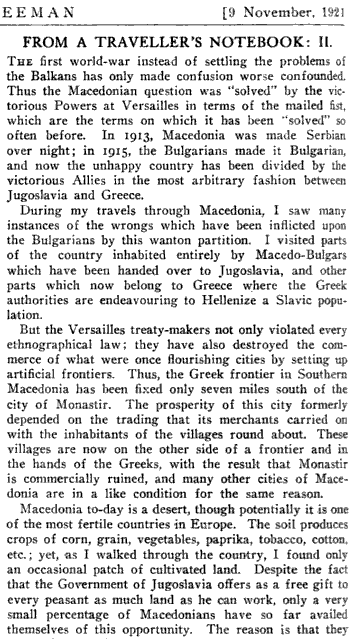 on why Macedonian sympathies would sway toward the Bulgarians than the other baby states of the balkans. Of course we are Macedonians, but western writers did not listen to the people, the mostly relied on their Dragoman(in Ottoman times) or their Translator in post Ottoman times. Nikola Karev's statement about leaning towards Bulgaria because they were the only one's giving assistance at the time also supports the above. There is another factor why they might have been leaning more towards Bulgaria. 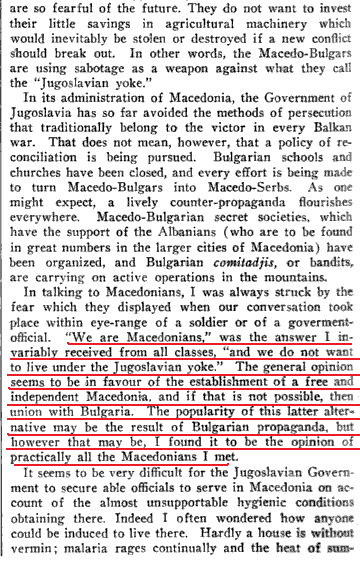 There was a huge Macedonian emigrant community in Bulgaria, and Macedonians filled government positions, filled the ranks of the military and the civil service - and as you say there was more sympathy (among Macedonians) in Bulgaria than anywhere else.